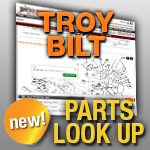 Troy Bilt Mower Blades: Jack's is your Place! We have the Blades you need, with fast shipping and great prices! For lawn mower parts and accessories, think Jack's! Center Hole 15/16" X 11/16"
Center Hole 3/4" x 9/16"
Center Hole 15/16 " x 11/16"